Actress Mali Harries a Super Furry Animals musician Cian Ciaran are among over 35 celebrities who have called on Cardiff Council to ensure that only Welsh medium schools will be opened across the city in the future. In a letter to the cabinet of Cardiff council, the well-known names argue that Cardiff needs to be leading the way in increasing Welsh-medium education provision, as its contribution to the national target of a million speakers. Amongst the other signatories of the letter are, Eisteddfod-crowned poet Catrin Dafydd, Cardiff-born musician Heather Jones and Pobol y Cwm star Siw Hughes. The letter also argues that the current lack of provision, means that some children from the most deprived backgrounds are being deprived of the chance to access to Welsh language and the vast opportunities it offers. "As you are aware, in order to reach the government target of a million Welsh speakers by 2050, it is essential that county councils are increasing their Welsh medium provision, and as Wales' biggest city, Cardiff has a key role to play in facilitating the reaching of this target. At present, the council is far from reaching its targets with regards to the percentage of pupils in Welsh medium education and therefore its contribution to the national targets. "More parents, from every background, wish to see their children grow up to be adults that are able to speak Welsh. However, at present, Welsh medium provision in Cardiff is totally insufficient. Families across the city are being turned away from Welsh medium education because of oversubscribed schools. Children from some of the most deprived backgrounds are being prevented from access to language and all the opportunities that it offers, due to a lack of information and a lack of provision. We are calling on you to transform this situation and to ensure that the Welsh language is accessible to everyone in the city, from St Mellons to Ely." "As Wales' biggest city, Cardiff has a key contribution to make if we are going to reach the national target of a million Welsh speakers. "Unfortunately, at present, the increase in Welsh medium provision is not sufficient enough to meet the great demand for places in Welsh medium schools, nor for Cardiff to reach its local targets on the journey towards 2050. 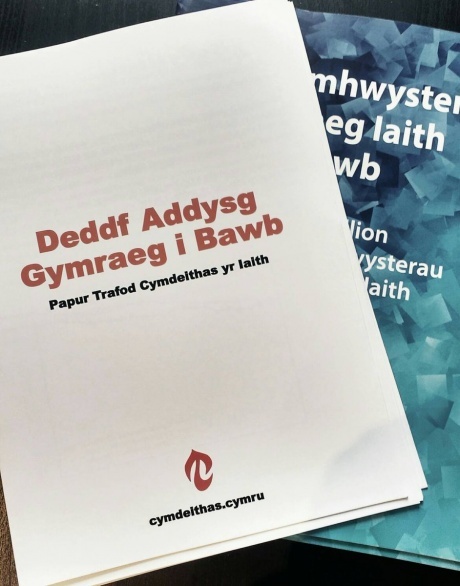 "We are calling on Cardiff Council to show the ambition and leadership which is needed to ensure that Welsh medium education is available to everyone in our capital city and to lead the way towards a million Welsh speakers."